Volkswagen Group is facing a new lawsuit in Germany claiming the company needs to buy back diesel cars, potentially for thousands of drivers, at the full original purchase price because of the emissions scandal. The suit by one car owner was filed Tuesday to become a sample case that may help thousands of other European claimants, according to Jan-Eike Andresen of legal-tech portal My-Right.de. The suit is the first filed in a project being litigated by German lawyers of U.S. law firm Hausfeld that is designed to skirt Germany’s lack of American-style class actions. My-right.de set up a website enabling car owners to sign up online to have their claims heard without running financial risks plaintiffs normally have because of Germany’s loser-pays rule. The company is cooperating with litigation fund Burford Capital. The website promises car owners “up to 5,000 euros ($5,200) in damages or to make VW buy back the vehicle. Hausfeld and My-right.de declined to say how many people signed up or describe the total value of potential claims. "VW has defrauded car owners for years," Andresen told reporters. "VW delivered nothing on what they promised to do to mend the issue." European consumer groups have been furious because Volkswagen won’t reimburse customers on its home continent the way it did in the U.S. Eight months after the emissions scandal broke, VW agreed in June to a $10 billion deal that provided American buyers with as much as $10,000. The carmaker has said rules in Europe are different and an engine repair is sufficient compensation. 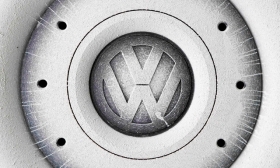 The suit is unfounded, VW spokesman Nicolai Laude said in an emailed statement Monday. Owners won’t have any problems once the car is fixed, he said. Of the about 2.5 million German buyers of VW group diesel cars, only around a thousand have sued VW or car dealers. While some suits were rejected, a quarter have been successful, according to the company. VW and their dealers appealed the setbacks, but settled when they faced the risk of losing an appeal, Sueddeutsche Zeitung has reported. Laude declined to comment on the settlements. The consumer case isn’t the only trouble facing VW, which is the target of 1,400 investor lawsuits filed in Braunschweig over the issue seeking a combined 8 billion euros. Andresen declined to say how many car owners have signed up, citing "tactical reasons." On average, the amount drivers could claim is between 22,000 and 25,000 euros, he said. The car in the case filed Tuesday is a 2010 VW Eos that cost about 41,000 euros. More suits will be filed against VW and its units, according to My-Right. My-Right hopes VW will be ready to settle for the whole group or potentially even for all European consumers. The lawsuit relies on EU laws and seeks to get a ruling from the EU’s top court that would be binding across the region, not only in Germany. "VW will only be able to reach the new start it is seeking if it extends its hand to its customers in a fair deal,” Andresen said.